Yesterday I blogged about the Berliner Weisse style and the version I brewed that took second in Sours for the NHC regionals. I had to send 3 bottles for judging to final round of the National Homebrewers Conference in San Diego last month. I got the score sheets back today. The final score was 39 out of 50 and the beer did advance within the finals to the mini best of show round. While I didn’t win anything in the finals I’m happy with the scores/feedback I got. Considering this is the largest beer competition in the world (bigger than GABF, World Beer Cup etc…) with 6,996 entries, 750 advanced to the finals, 30 of those being in the sour category. I don’t have any of that batch chilled for a pic but (and I promise the pics will get better when I finish my light box) so I am celebrating with another Berliner type beer. This one was an experiment for sure that I think was a success. My last brew was a used up some grain type Saison. Other than the base malts of Pilsner, Wheat, Munich I had some grain I wanted to use up. I dont have the exacts in front of me ( if anyone wants me to get them I’ll gladly post) but in the 20 gallon batch it also had about a pound each Rye, Golden Naked Oats, and Special B. Well right before I was going to start removing the spent grain from the mash I thought hmmmm I could get a bonus 5 gallons of something sour. So I ran some more hot water into the mash stirred it up let it sit another 20 minutes. After that I started draining the 3rd runnings from the mash into a 6 gallon Better Bottle. Mixing in a few cups of light dried malt extract I had a 1.028 gravity wort with lots of good live lactobacillus in it. When the temp of the wort got down to 80 degrees (not a good pitching temp for normal beer but about 4 hours later) I pitched a pack each of Lacto, Brett Lambicus, and Wyeast 1338 Euro Ale yeast. A few weeks later it had fermented down to 1.001. 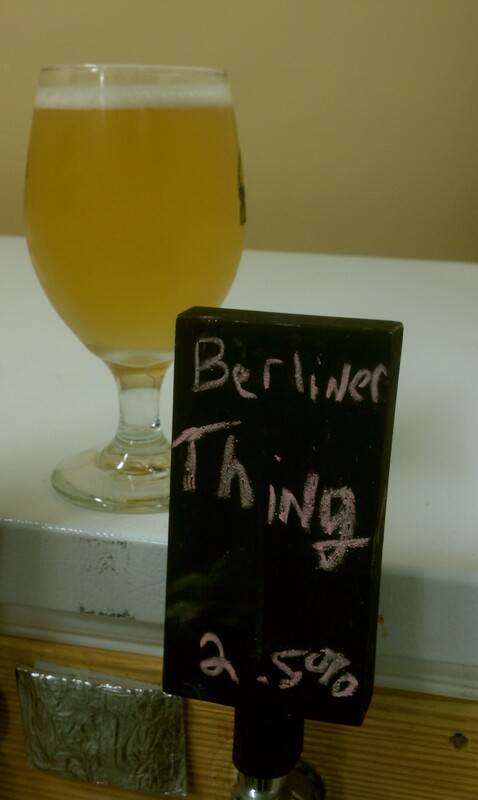 Its a very refreshing light beer, mildly tart, touch of brett, and very effervescent. Clarity is pretty bad on it, but I think on this beer the fines still in suspension are what adds to this beer. Very much a rustic type of beer I picture some farm hands probably enjoyed. Even at a few weeks old and on tap already its got alot of flavor mostly due to the no boil and higher than normal temps.